2018 FAMILY CAMPING WEEKEND • IS OVER! About 35 Valley folks got together for a couple of days of fun and fellowship! We wish you could have joined us! This web page will be updated as soon as plans are firmed up for 2019. 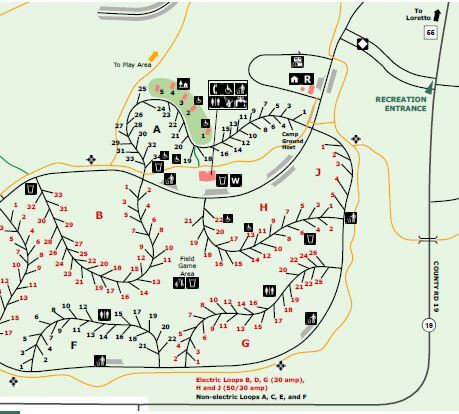 WHERE: We're camping at Baker Park Reserve Campground near Maple Plain, MN. (2309 Baker Park Road, Maple Plain, MN 55359, 763-694-7662) is located on Lake Independence in Maple Plain. ​Click here to find out more about the Three Rivers Park District in northern Hennepin County and things to do and see in the area. COST: Cost for the 30 amp electric campsites is $60 for two nights. Each site has a picnic table, a fire ring, and can accommodate two tents or one tent and one RV, with a maximum of 8 people per site. Check-In is 4:00pm; check-out is 3:00pm. Cost for the 30-50 amp electric campsites is $70 for two nights; all sites have the same amenities with a maximum of 8 people per site. Pets are welcome on leash. Quiet Time is from 10:00pm - 7:00am. Firewood is available for purchase at the Campground Office. If you want to come down on Saturday for just the day and come out to the campground for worship time, there will be a Visitors Day Pass that must be purchased. Fill out the form below to reserve your campsite. In the Comments box, let us know how many are in your party and the type of camping equipment (pop-up, tent, etc.) you are bringing. DEADLINE TO RESERVE AND PAY IS AUGUST 19! Deadline to reserve and pay is August 19! Your payment confirms your reservation. Payments are not refundable. If you have questions, please email Pastor Sheri. Friday Night, August 24 at 7:00pm ~ Family Fun Around The Campfire (weather permitting). Bring supplies for your favorite campfire treat! We're going to have a great Valley family get-together! Start planning now and save this weekend for a great family get-together with the Valley church family.